Uriel Lopez (left) has worked at Ripp's Dairy Valley farm in Dane, Wis., for 10 years. Here he is seen in the milking parlor with co-worker Eddy Aquilera, who has worked there for four years. Eleven of the 12 non-family members who work at Ripp's dairy are Hispanic immigrants. Photo taken on Sept 12, 2017. DANE — On a recent cool, summer evening in the rolling hills just outside Madison, the capital of America’s Dairyland, the lofty pole barn of Ripp’s Dairy Valley farm briefly transformed into a town hall meeting. As twilight descended, a crowd of more than 60 farmers, public officials, dairy workers and rural residents grabbed bowls of ice cream and took their seats for the event, sponsored by the Professional Dairy Producers of Wisconsin, to learn about farming and discuss the direction of the state’s signature industry. Chuck, Troy and Gary Ripp, owners of the farm, a large operation with about 850 milk cows, faced the crowd and fielded questions. The main topic of the night, elevated to the forefront by the election of President Donald Trump: immigration. Immigration as a top line issue for dairy farmers would have been unthinkable just a generation ago when Wisconsin’s agricultural landscape was dominated by small and medium-sized dairy farms run by the families that owned them. Now, the nation’s No. 2 milk producing state is home to a growing number of large concentrated animal feeding operations. These businesses, which operate 24/7, year-round, require work that farmers insist most Americans will not do. Nationally, more than half of dairy workers are immigrants, according to a 2015 industry-sponsored study, with farms that employ immigrant labor producing 79 percent of the nation’s milk. The Wisconsin Center for Investigative Journalism asked farmers, academics, a union activist and the state’s recently retired agriculture secretary how Wisconsin’s dairy industry came to rely on immigrants to keep it afloat — and what could be done to put it on a more sustainable and legal path. The answers include raising wages and benefits paid to dairy employees, increasing automation so jobs are less physically demanding and farmers need fewer workers, and changing federal law so immigrants can work here legally. Shelly Mayer believes the problem is broader than the dairy industry. 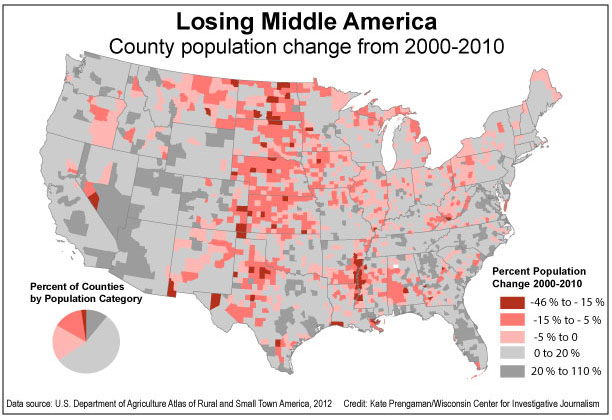 Between 2000 and 2010, Wisconsin’s population grew by 6 percent, but more than a quarter of Wisconsin’s 72 counties lost population. 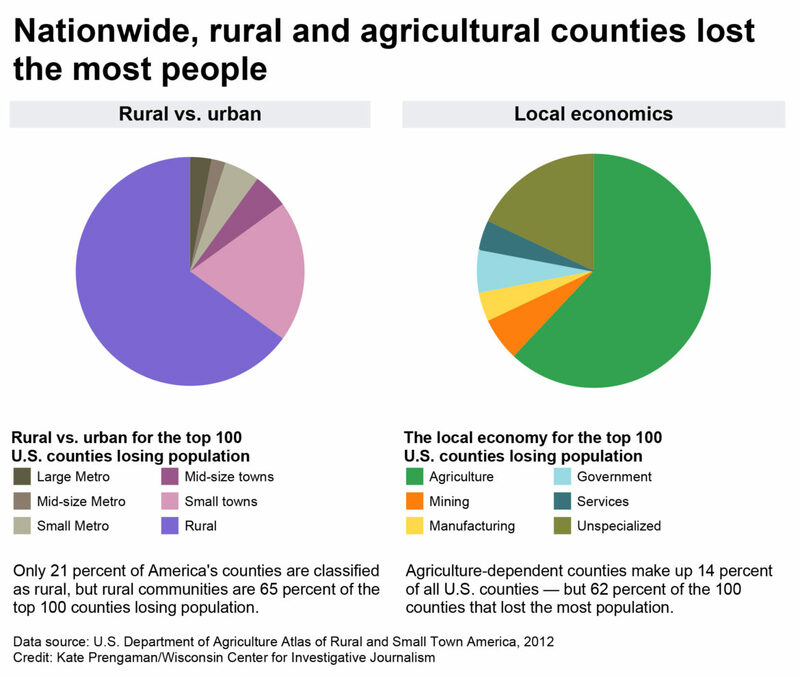 Most of the losses in Wisconsin and nationally were in rural areas where the main industry is agriculture, the Center has reported. And these days, Wisconsin businesses complain they cannot find enough workers to fill positions as the state experiences near-record 3.2 percent unemployment. At the same time, federal figures show the number of hired workers on dairies in Wisconsin has nearly doubled since 2006 to about 14,000 — a reflection, Mayer said, of the move away from family labor that fueled small farms that once dominated the industry. Another factor is what farmers such as Tim Keller describe as a lack of work ethic by U.S.-born workers. 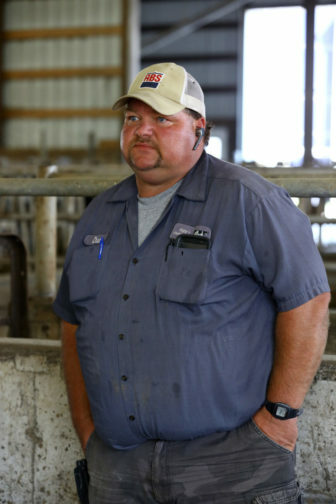 Keller milks 330 cows on his 600-acre farm near Mount Horeb, about 25 miles west of Madison. He has five immigrant workers, including his “right hand man” who hails from Uruguay. Keller said the employee, who is here legally, has worked for him for 11 years. Keller said he voted for Trump but disagrees with the administration’s threats to deport all undocumented immigrants. His Hispanic employees are hard-working — and highly valued, Keller said. Eleven of the 12 non-family members who work on the Ripp farm are Hispanic immigrants. 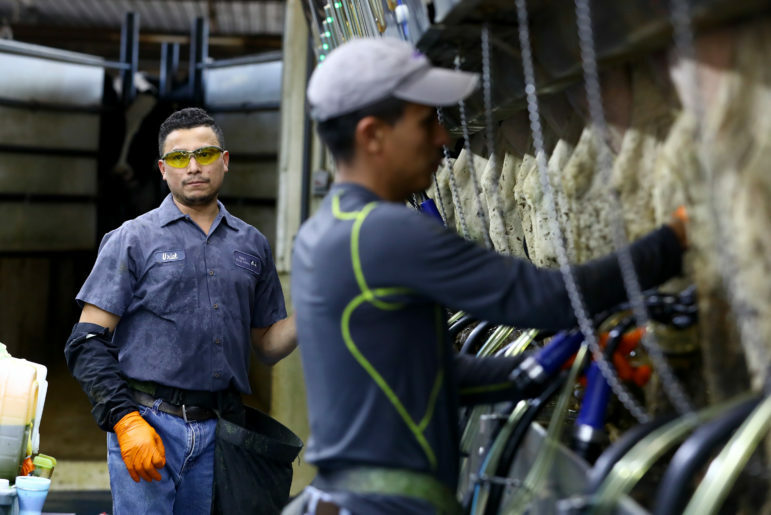 In recent years, dairy farmers have become accustomed to cheap, flexible labor, said Jill Lindsey Harrison, a former University of Wisconsin-Madison faculty member who studied the rise in immigrant dairy workers in Wisconsin, a trend that started around 2000. Harrison, who now teaches at the University of Colorado-Boulder, said such workers are willing to work long hours under “pretty crummy” conditions to support themselves and their families. “In all those communities, it was a matter of what wages needed to be paid to get people to do onerous jobs that most people don’t want to do,” said Rainford, a Madison-area field representative for AFSCME who was speaking for himself and not the public employee union. Rainford does not buy the argument that Americans will not clean out barns or get up in predawn hours to milk cows. Rainford said relying on immigrant labor drives down wages to “unnaturally low” levels for dairy work, meaning U.S. citizens cannot get jobs with family-supporting income in their home communities. But raising wages could leave farmers short when the sometimes-volatile price of milk drops, Oconto Falls farmer Tim O’Harrow said at a forum on the future of the immigrant dairy workforce in Madison last month. Farmers insist their immigrant workers are paid fairly, and that pay is rising. Chelsea Hansen examines a malfunctioning piece of equipment in the milking parlor at Ripp’s Dairy Valley farm in Dane, Wis. Hansen, the herdswoman on the farm, is the only non-immigrant non-family employee on the farm. She grew up in a dairy family in Deerfield, Wis. “I think I’m different than a lot of people like me — like white people. The only thing I learned was how to work. These guys (the immigrants) are in the same kind of position as me.” Photo taken on Sept 12, 2017. In just the past year and a half, Ripp said his farm boosted starting wages from $8.50 an hour to $11 — plus housing — as the flow of immigrants crossing the southern U.S. border has slowed. Workers with their own housing start at $12 an hour, he said. Some of his longer tenured Hispanic workers earn $15 an hour. Dane County, where the Ripp farm is located, considers $12.50 an hour and above to be a living wage. Chuck Ripp said in an interview that raising pay too much could hurt the dairy industry, which has been hit by low milk prices. Philip Martin, an expert in agricultural employment, said farms can deal with labor shortages with the help of Congress, increased automation and better pay and benefits. Martin is a professor emeritus of agricultural and resource economics at the University of California-Davis. Martin said farm owners need to increase mechanization — such as automatic cow feeders and robotic milking systems — to improve productivity, make jobs less physically demanding and ultimately shrink the size of the workforce. He noted that such labor-saving devices have led to a sharp decline in the proportion of the U.S. workforce engaged in agriculture. Mark Misch sees the trend toward mechanization as he travels the Upper Midwest as a salesman for a company in Sun Prairie that sells waterbeds for cows. Martin said more machines and better pay will not be enough, however. He noted that Congress is considering expanding the guest worker program to include dairy workers. Currently, the so-called H-2A program is confined to seasonal farm workers. Brancel, who served as a Republican lawmaker and state-level director for the U.S. Department of Agriculture, said politicians in Washington, D.C., need to stop arguing immigration policy “at the extremes” and adopt law changes that recognize the need for immigrant labor in agriculture while still limiting the people who can qualify for citizenship. Chuck Ripp, one of the owners of Ripp’s Dairy Valley farm, in Dane, Wis., on Sept 12, 2017. Eleven of the 12 non-family members who work on the farm are Hispanic immigrants. “We need to get a program so we can get these guys some kind of paperwork so INS (immigration enforcement) can’t just take them away if they get pulled over or something. They should just be left alone and have the freedom to be here,” he says. “Unfortunately right now, there isn’t any stability in immigration policy,” said Brancel, who retired from public service in August to run his beef cattle farm in central Wisconsin. Chuck Ripp also wants changes. Some of his employees, like Sergio Rivera — who has worked for Ripp for 14 years — can go long periods without seeing their extended families. “I like (to go) back to Mexico to see my family … but right now it’s just more hard,” said Rivera, who cares for calves on the farm, where he lives with his wife and daughter. There is anecdotal evidence that some immigrant workers are leaving Wisconsin in the face of stepped up enforcement. In the Chicago regional office of Immigration and Customs Enforcement, which encompasses six states including Wisconsin, arrests are up under Trump, from an average of 538 per month at the end of President Barack Obama’s presidency to an average of 776 arrests per month for the first six months under Trump. Despite the threat of arrest emanating from Washington, Harrison said she does not expect a wave of voluntary departures. “You’ve got people who are desperate to be here to work,” Harrison said. “So they’ll keep a low profile. They’ll say ‘yes’ to what’s offered to them. They’ll make as much money as they can while they can. It’s heart-breaking. Elise Foley of HuffPost contributed to this story, reported in collaboration with HuffPost as part of its Listen to America bus tour, with stops in Milwaukee Oct. 6, and Des Moines, Iowa, Oct. 9. IowaWatch is the Iowa HuffPost partner for the tour. The nonprofit Wisconsin Center for Investigative Journalism (www.WisconsinWatch.org) collaborates with Wisconsin Public Radio, Wisconsin Public Television, other news media and the University of Wisconsin-Madison School of Journalism and Mass Communication. All works created, published, posted or disseminated by the Center do not necessarily reflect the views or opinions of UW-Madison or any of its affiliates.